The August issue of Tabletalk is out. This issue features articles explaining that the ordinary Christian life, the life to which all believers are called by the Lord Jesus, is, by its very nature, the radical Christian life. Faithful obedience to God in every sphere of life is considered out of the ordinary by many Christians, but only because we are often disobedient to the radical, transformative call of Christ. This issue will help us better understand what the ordinary Christian life looks like in our families, in our churches, and in our vocations. It will point out examples of ordinary believers throughout Scripture. Contributors include R.C. Sproul along with Nancy Guthrie, Joe Holland, Derek W.H. Thomas, Russell D. Moore, Michael Horton, Tim Challies, Tedd Tripp, Sean Michael Lucas, R.C. Sproul Jr., Erik Raymond, John MacArthur, Albert N. Martin, Eric B. Watkins, Robert Rothwell and others. 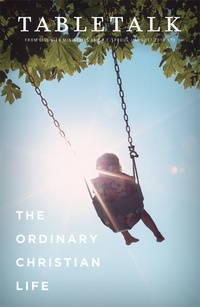 An Ordinary Christian Son by R.C. Sproul Jr. The September issue explains the nature, place, and purpose of parachurch ministries. The October issue will seek to provide a basic hermeneutical tool by examining the meanings of some of the most important biblical contrasts.